Twenty years ago there were only five commercial wineries in the state, so Colorado's wine industry is still in its teenage years. Today, there are over one hundred! Most wineries popped up organically as families decided to give the wine lifestyle a try. Eventually, some wineries changed ownership. Our guest today is the assistant winemaker at one such winery. Mesa Park Vineyards is the newest incarnation of Mesa Grande Vineyards. Bought by the Price clan (Chuck and Patty Price along with their daughter Brooke and her husband Brad Webb) in 2008, they handcraft red wines from the classic Bordeaux cultivars: cabernet sauvignon, merlot and cabernet franc. 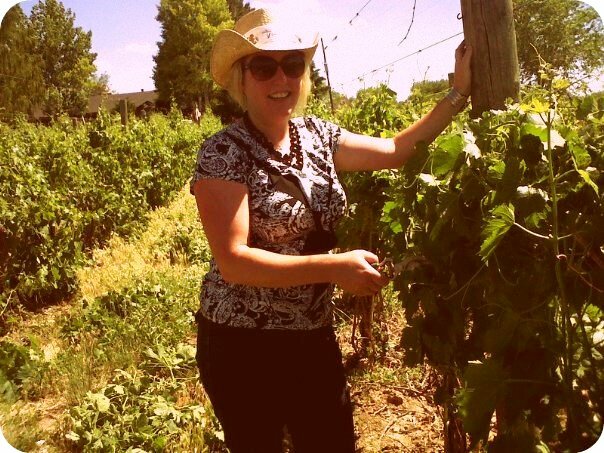 Brooke, now juggles being assistant winemaker, mother and a job, but she found the time to answer our questions! CWP: How did you get into wine making? Our family purchased Mesa Park Vineyards in 2009. Chuck, my dad, and I share the wine making duties and responsibilities. We rely on him because he has an extensive engineering background and is very process driven which is extremely important in wine making. This is a dream come true for our family. We have our own vineyard and spend a lot of time working the vines. If we were not doing this hopefully we would be in another agriculture venture. We spend a lot of time at the winery, but we love to cook and prepare meals and entertain at our place. We enjoy our menus with a wide variety of wine, but we try to support our local wines which are excellent in quality right now. We are making our first rosé this year. We picked merlot grapes about two weeks ago to start this process. We kept the juice on the skins for about 16 hours and then pressed the juice into a stainless steel fermentation tank where it is slowly fermenting. The plan is to have a nice dry rosé. We will be bottling this is the Spring of 2012. I recently had a 1986 Dom Pérignon that a sommelier friend shared with us, although past its prime it was amazing how well it had stood up. I would love to make a sparkling wine someday. Norah Jones: high quality, classic, mellow and pairs well with food and good company. I think the ones who have discovered it are very impressed with the quality. Our job is to get our wines in more people's hands. I see the Industry continuing to grow at a steady pace and the quality continuing to improve. I am encouraged with the support consumers are giving to local small businesses that focus on quality. Have you been to Palisade? If not please come and meet my family at Mesa Park Vineyards soon! I have been to Palisade and I think it is a great wine country that every Coloradan should experience!